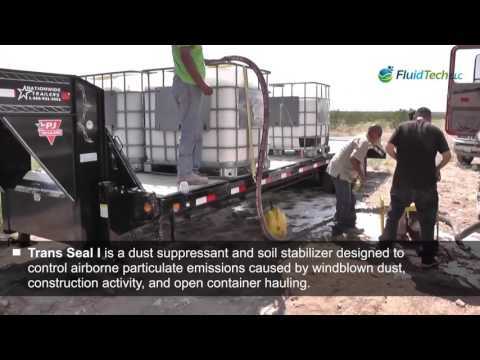 Trans Seal I is a dust suppressant and soil stabilizer designed to control airborne particulate emissions caused by windblown dust, construction activity, and open container hauling. 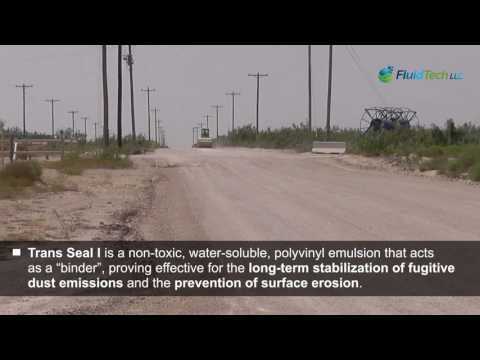 Trans Seal I is a non-toxic, water-soluble, polyvinyl emulsion that acts as a “binder”, forming a crust over the treated surface proving effective for the long-term stabilization of fugitive dust emissions and the prevention of surface erosion. 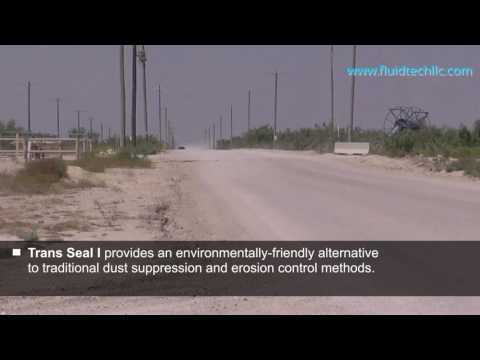 Trans Seal I is more effective and environmentally friendly than traditional salt-based dust suppressants (i.g. MgCl2) which are ineffective in climates with low relative humidity and have come under increased environmental and regulatory scrutiny. 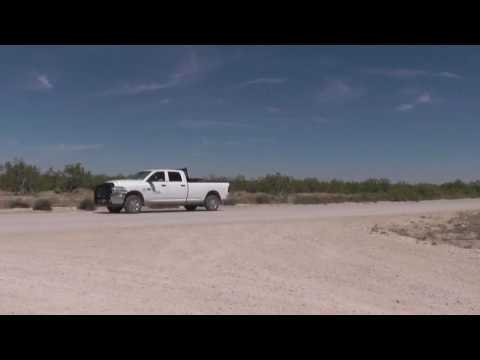 Developed and utilized as a dust suppressant and soil stabilizer in 1999, Trans Seal I stops fugitive dust emissions (PM10 and PM2.5), conserves water resources, and eliminates the need for continuous treatment. Application of Trans Seal I will save money by eliminating the need for dedicated personnel to manage site dust issues, improve safety through the mitigation of visibility-related incidents and respiratory-related illnesses, and will not harm humans or the environment. Trans Seal I is an effective guard to maintaining the physical integrity of slopes and embankments. Trans Seal I acts as a binder, penetrating soils and forming a crust that protects soils from erosion in high-wind environments. This binding effect reduces soil permeability, preventing water saturation and subsequent erosion of the treated soils. Trans Seal I is an effective and environmentally safe approach to limiting storm water and ground water runoff and will not cascade off of a treated area. Trans Seal I eliminates the costs associated with rebuilding slopes and embankments, mitigates downtime due to reconstruction efforts, and often increases flora recovery in an affected area. By penetrating and binding soils, Trans Seal I can stabilize areas subject to constant traffic and heavy hauling. Application of Trans Seal I creates a smooth, firm, durable surface that decreases maintenance and equipment costs and reduces the need for blading, watering and gravel replacement. Trans Seal I increases load bearing strengths of treated soils to meet California Bearing Ratio (CBR) requirements and has proven effective at maintaining the integrity of soils subject to extreme weights and weather conditions. Trans Seal I was originally developed as a coal topper to control the blowback of coal dust when transporting coal by unit trains from the mine to the utility customers. As a coal topper, Trans Seal I effectively controls the blowback of coal dust in transit and the dust clouds generated during discharge of coal from the railcar. Due to its unique formulation, Trans Seal I actually increases the BTU content of the treated coal. The acrylic properties of Trans Seal I allow for adhesion to most surfaces, providing for easy application of a non-hazardous fixative to control the spread of contaminants and mitigate the potential for hazardous dust bursts during decontamination and decommissioning activities. Trans Seal I has proven effective in asbestos remediation and the demolition of radioactive and hazardous facilities. Using Trans Seal I for contamination control provides an extra level of protection for workers and the environment. 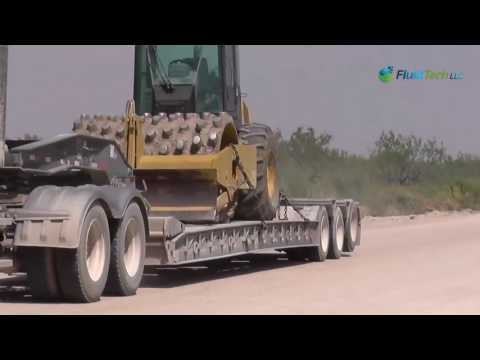 Fluid Tech looks forward to helping you succeed in meeting your dust suppression and erosion control challenges! Please contact us today to find out more how you can control dust, conserve water, and save money! Grading and rollpacking prep, truck driving on road with and without "Trans Seal I"
The Trans Seal works like a charm. 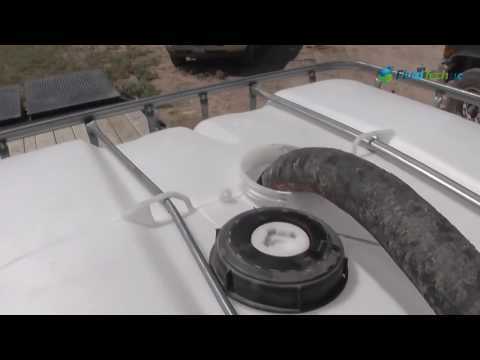 I used about 1 gallon per 50 gallons…this is a much more cost effective solution to asphalt or gravel.